Tides Marine designs and manufactures a complete line of drip free, self-aligning bearings and seals for rudder and shaft assembly applications. These high quality, innovative products make sail-handling simple and easy. Additionally, they reduce maintenance costs and improve vessel performance. Propeller Depot carries the entire line of Tides Marine SureSeals, and is able to ship them to over 130 countries across the Globe. If you have any questions on Tides Marine shaft seals, reach out to the experts at Propeller Depot. The SureSeal shaft seal is an innovative product that has now become a best seller. It is a self-aligning, drip-free propeller shaft seal that supports shafts of various sizes, from one to eight inches and 25 to 160 millimeters. 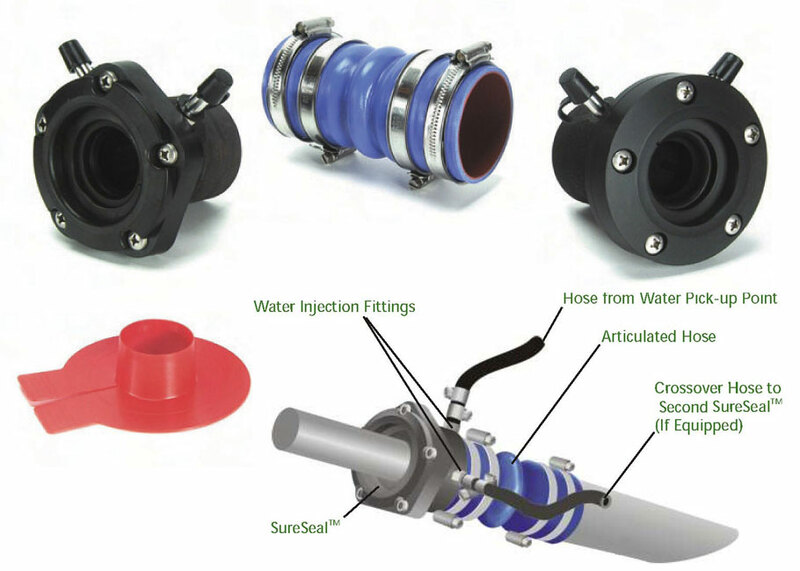 A SureSeal model is also available for twin engine vessels, and this product features dual injection fittings, thus allowing the installation of a passive crossover line between the two seals. This is an advanced product, as it supplies lubricating water to cool the engine if you have a breakdown or if you are trolling with the engine idling. Propeller Depot offers competitive pricing on the entire line of Tides Marine SureSeal marine shaft seals. Ordering a SureSeal shaft seal is not a complicated process. You must simply confirm that adequate installation space exists between the coupling and the stern, and take accurate measurements of the stern tube's OD and the propeller shaft's diameter. SureSeal's patented design includes a removable front cap, thus improving lip seal access: a worn out lip seal can be removed and replaced, even underwater. The SureSeal water injection fitting is manufactured from 316-grade stainless steel and features a cap made from durable plastic. Therefore, if it is necessary to remove the injection hose, the cap prevents a rush of water from entering the vessel. Tides Marine is dedicated to designing and manufacturing products that improve vessel reliability and performance, reduce the cost of maintenance, and solve unique issues for each client. Tides Marine plans to become the worldwide brand of choice for boating customers. For this reason, the company is committed to delivering incomparable service to boat owners, repair facilities, yards, dealers, and boat manufacturers. Regardless of your individual needs, Tides Marine is ready, willing and able to offer helpful advice and top quality products. Long-term boating enjoyment is the goal at Tides Marine. The company designs and manufactures marine system components with the goal to increase performance, reliability, and lower the frequency of maintenance -- the perfect equation to reach their goal. Whether a boat builder, yard, loft, or vessel owner, Tides strives to make effective use of technology, as it becomes a global brand. Presently it is a member of the American Boat and Yacht Council, as well as an International Standards Organization member, and builds to American Bureau of Shipping standards. Tides Marine specializes in Drip Free shaft seals, sail track, and rudder bearings. Water pickup kits, fittings, hoses, and rings are also part of their impressive lineup, made from the highest quality materials. The self-aligning Drip Free shaft seals are the most popular shaft seals used by US pleasure boat builders in the United States. Redefining the boating standard is a powerful achievement for any company, but even more so in a world dominated by large corporations. Established in 1990, Tides Marine is happy to work with clients to provide the exact custom products they need. Clients are encouraged to be involved in the design process, and will know exactly where their part is -- from the drawing board to the production floor, until it is successfully installed on their vessel. Their competitive rates ensure customer satisfaction without the expense. Propeller Depot is a proud dealer of Tides Marine products -- an honor reserved for dealers well educated and versed in the boating world. Tides Marine was chosen to be part of the Propeller Depot arsenal because of their commitment to quality and durability in combination with attentiveness to client needs, and the overall desire to provide a top-quality product. For true efficiency, innovation, and quality, Tides Marine provides nothing but the best. If you have any questions on any of the Tides Marine parts, please contact the experts at Propeller Depot. The entire product line of Tides Marine parts is able to be shipped world-wide, at the lowest prices.